Ohhhhhh this is ADORABLE! 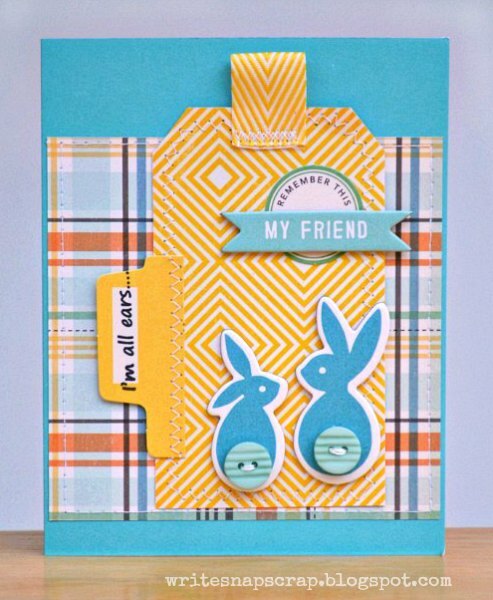 I loveeeeeeeee the colors, the bunnies and loving that sentiment!!!! This is such a sweet card, Izzy. The color scheme is so uplifting and is perfect for a supportive card like this. The bunnies are so cute with their button tails and I love the plaid as a backdrop to pull the colors together. Ok those little bunnies w/ their button tails are just so darn cute!!! Super job! Love it izzy! Those little button butts are adorable! Love this. The button butts are sooooo freaking cute! love those colors and the orange ppr is so cute! Super adorable! Love those bunnies! The cutest! I love that you added little buttons on the back of the bunnies. That is SO cute! I love the button cottontails and the sentiment. Such a great idea! Very cute and I am sure your friend will appreciate it. Lovely! I'm sure it will be very much appreciated. What a great card! I really love it when cards say something clever and pertinent. I love "I'm all ears, my friend." I will have to "borrow" that! I also love how clean and great-looking your blog is. You are so talented! This is really cute Izzy! I love the sentiment and the litte card is bright and uplifting! Gorgeous! LOVE this card - the buttons for the bunnies' tails are super cute!